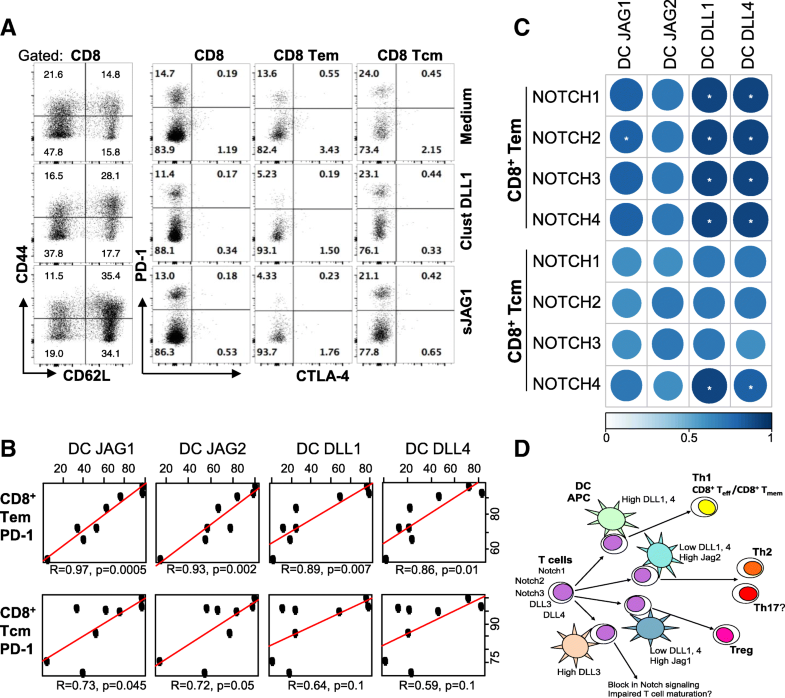 In the immune system, Notch provides instructive signals for priming CD4+T-cells and governing the differentiation of T helper (Th), follicular Th, and regulatory T (Treg) cells [5–11]. Notch has been shown to promote Th1 differentiation by upregulating T-bet and Ifn-γ expression . It can also transactivate Th2-promoting genes Il4 and Gata3 . Notch ligand-specific signaling can alter Th1 or Th2 differentiation with different ligands supporting distinct polarization of Th cells [13–16]. 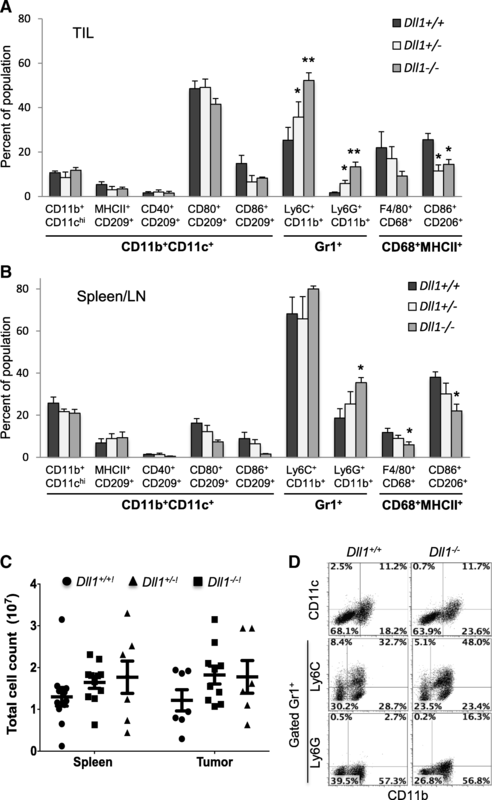 Most gain-of-function studies indicate that Delta-like ligands promote CD4+T-cell commitment to Th1 type [17, 18]. Although controversy exists, studies support that Jagged ligands induce Th2-promoting Notch signaling [17, 19]. Notch also regulates Il17 and RORγt gene promoters to influence Th17 differentiation . In addition to guiding Th1, Th2 and Th17 differentiation, expression of Jagged ligands by APCs or hematopoietic progenitors can favor generation of suppressive T-cells in vitro or Treg cells in vivo [20–22]. 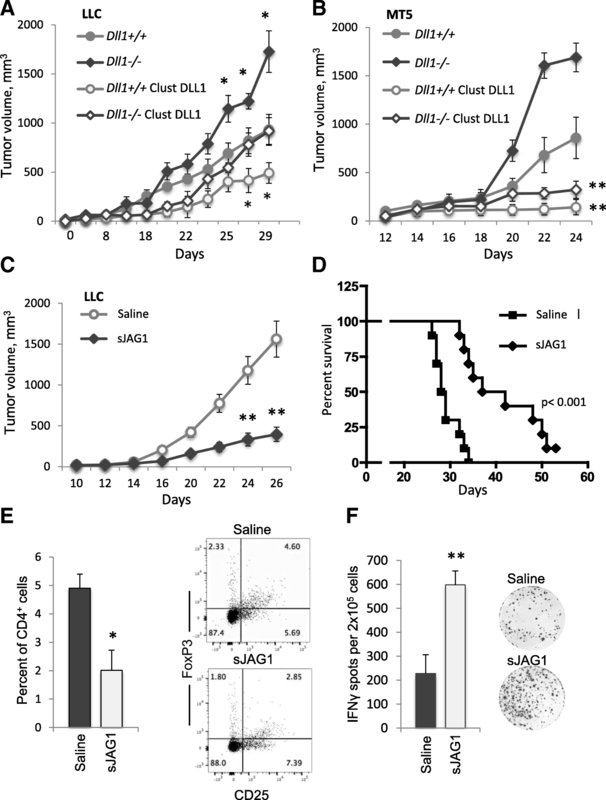 Systemic blockade of Jag1 and 2 with Jagged ligand-specific antibodies overcame tumor-induced T-cell tolerance, indicating the involvement of these ligands in T-cell suppression . Expression of Delta-like ligands, but not Jagged, in hematopoietic compartments was altered by tumor-derived factors to cause tumor-induced immunosuppression [20, 24, 25]. An alternative hypothesis posits that interaction of DLL4 expressed by dendritic cells (DCs) and Notch1 on T-cells may fine-tune sensitivity, magnitude and quality of the CD4+T-cell response by promoting metabolic reprogramming, rather than by specifying lineage choice following the initial exposure to the antigen . It is known that a transient pulse with high levels of Delta-like ligands can induce Hes1 expression for a duration that is sufficient to induce a binary cell fate switch in T-cell or natural killer cell differentiation . Both Notch1 and Notch2 have been identified as key players in anti-tumor T-cell immunity including induction of tumor-specific cytotoxic T lymphocytes (CTL) and memory T-cells [21, 23, 26]. Studies also indicate that Notch regulates effector cytokine production by CD8+T-cells [5, 27, 28]. Notch signaling is highly responsive to variation in Notch ligand expression in hematopoietic organs [31–33]. Previous studies showed that altered expression of Notch ligands could underlie immunosuppression in cancer, and in particular, expression of Delta-like ligands DLL1 and DLL4 was significantly down-regulated in tumor-bearing hosts [20, 24, 25]. DC lineage-specific genetic ablation or systemic blockade of DLL1-Notch interaction, as shown in this study, resulted in accelerated tumor growth in the tested lung and pancreatic tumor models, likely due to insufficient DLL1 signaling and consequent impairment of anti-tumor immune responses. 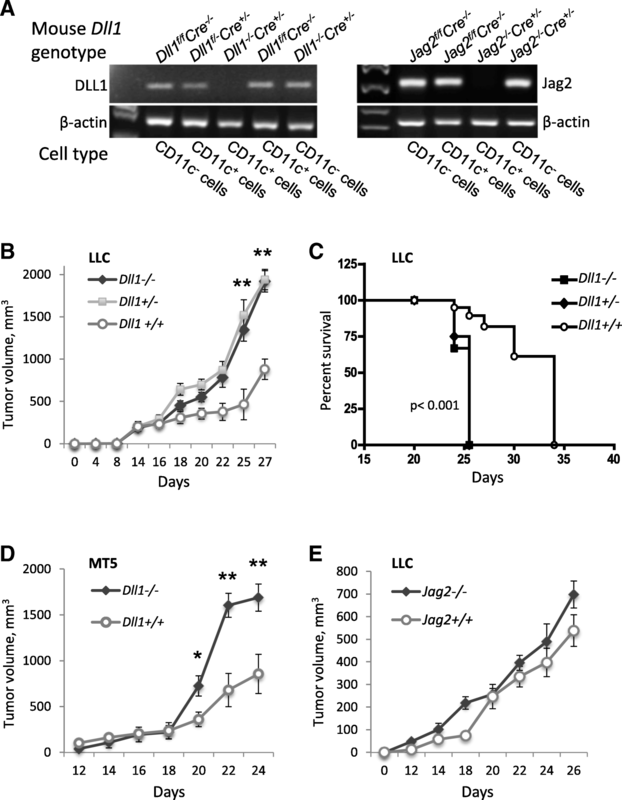 Deficiency in DLL1 expression in DCs resulted in a significant reduction of CD8+ T-cell activation, tumor antigen-specific CTL and differentiation of central memory CD8+CD44+CD62L+ T-cell populations. 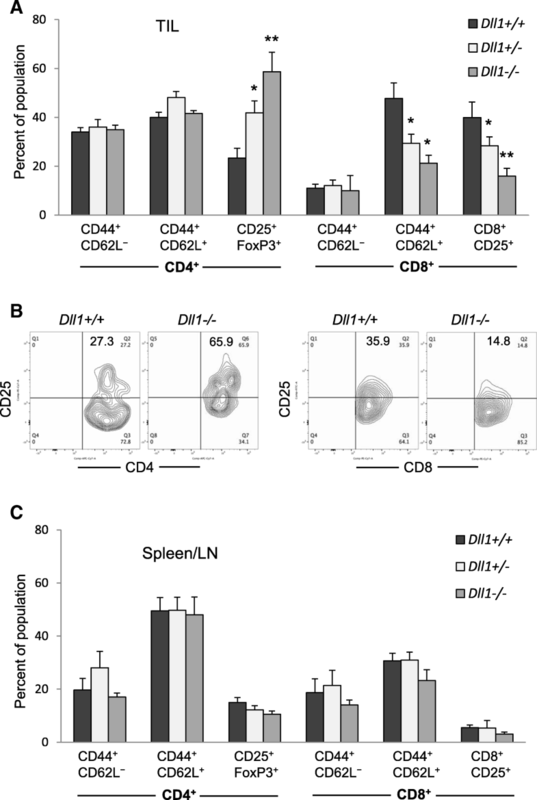 The DLL1 deficiency was also associated with an accumulation of monocytic and granulocytic CD11b+Gr1+ cells and increased differentiation of Treg cells. 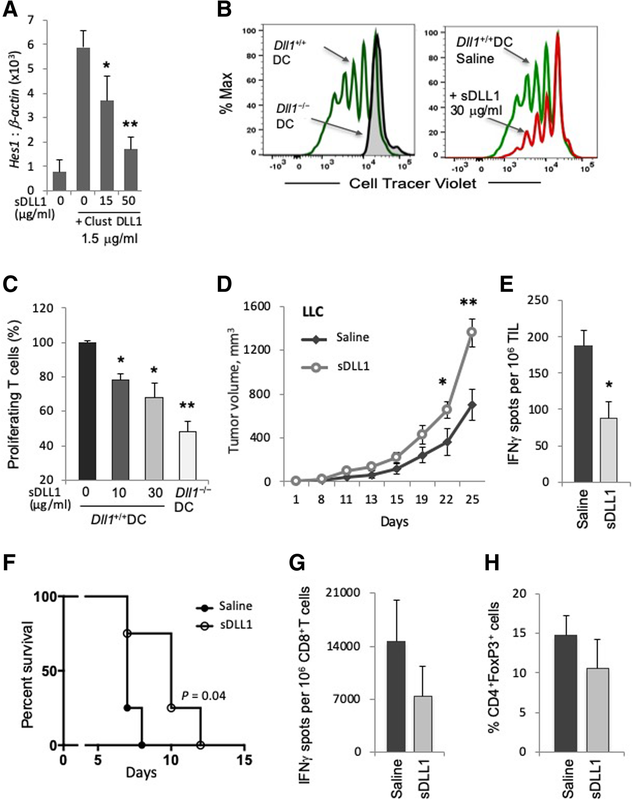 The results imply that the adequate expression of DLL1 in DCs is a prerequisite for eliciting effector T-cells and efficient anti-tumor responses. C57BL/6 mice with floxed alleles for the Dll1 gene were received from Dr. J. Lewis (Cancer Research UK, London, UK); Jag2 gene-targeted floxed mice were kindly provided by Dr. T. Gridley (Maine Medical Center, Scarborough, MN). 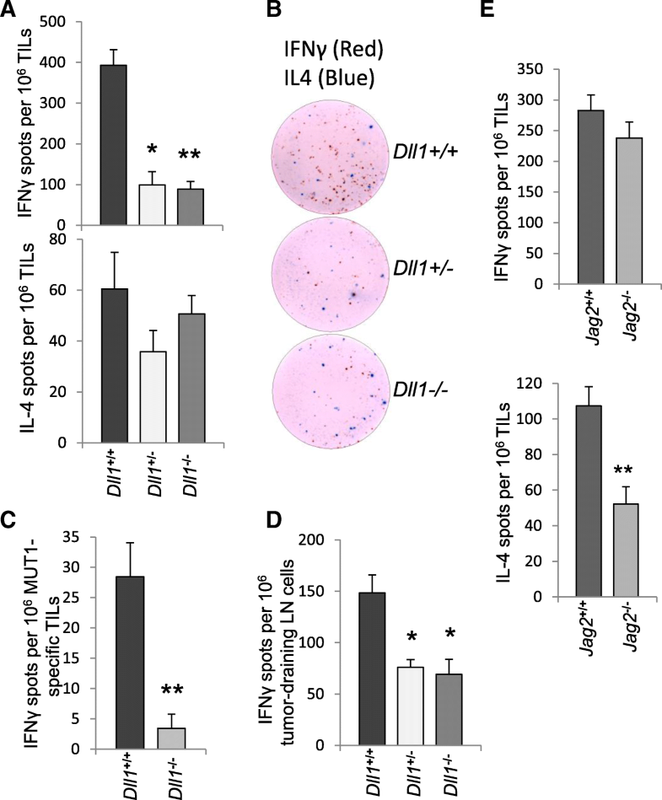 Generation of Dll1flox/flox and Jag2flox/flox conditional knockout mice and genotyping of floxed and deleted alleles have been described previously [45–47]. B6.Cg-Tg(Itgax-cre)1-1Reiz/J mice expressing Cre recombinase under the CD11c (integrin-αX; CD11c-Cre) promoter were purchased from The Jackson Laboratory. The animals were housed in pathogen-free units. We generated mice bearing deletion of Dll1 or Jag2 in CD11c+ cells by mating syngeneic B6.Cg-Tg(Itgax-cre)1-1Reiz/J mice expressing Cre-recombinase under CD11c promoter and DLL1flox/flox or Jag2flox/flox mice and then by crossing their progeny. In the resultant mice, CD11c+ cells with hetero- or homozygous allele deletion had genotype Dll1flox/−Cre+/−, Jag2flox/−Cre+/−, Dll1−/−Cre+/− or Jag2−/−Cre+/−, respectively. Their littermates with “floxed” alleles but without Cre recombinase transgene served as respective controls in all animal experiments. The allele deletion was confirmed by genotyping and by the assessment of Notch ligand mRNA expression in flow-sorted CD11c+DC populations from the spleen by PCR and RT-PCR using genomic DNA and RNA samples, respectively, with sets of primers specific for floxed and deleted alleles and for ligand mRNA described previously [24, 45–47] (Fig. 1a).